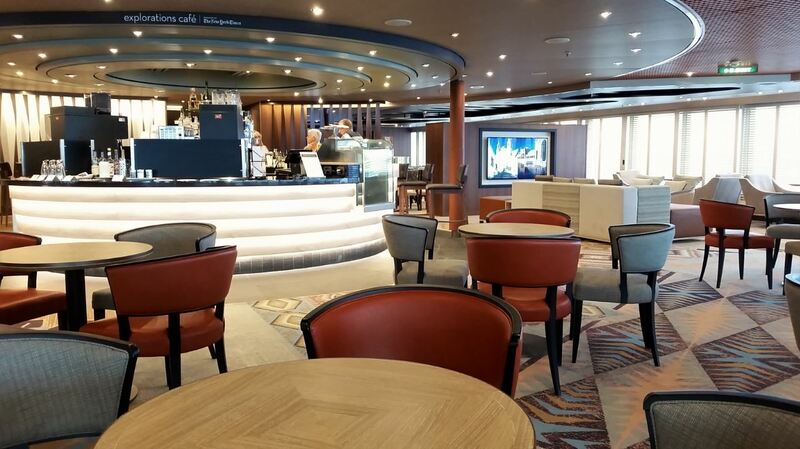 Holland America Line’s ms Westerdam has emerged from a 12-day drydock with new public spaces and amenities, including the first Explorations Central and Rijksmuseum at Sea. With the addition of Lincoln Center Stage and Billboard Onboard guests can now enjoy a full night of entertainment in the Music Walk onboard Westerdam. 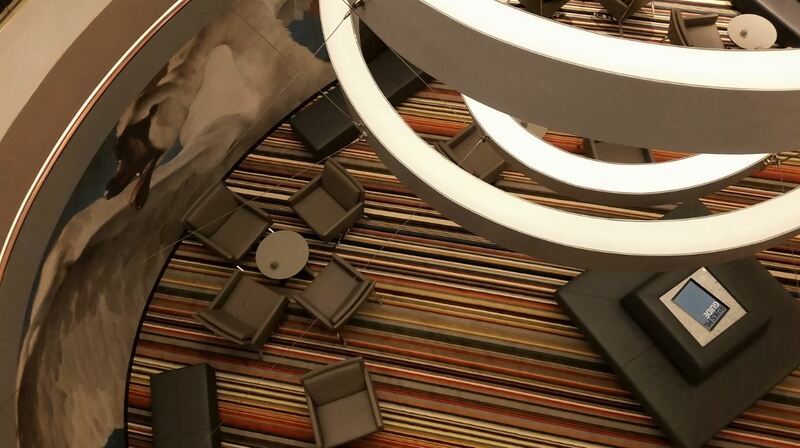 To complete Westerdam’s transformation the intimate Gallery Bar, a reimagined Lido Market, new staterooms and a private area with cabanas were introduced. As part of a $300 million fleetwide investment program Holland America Line‘s ms Westerdam has recently undergone a 12 day dry dock, emerging as a new ship. Making it’s debut on Westerdam, and a major feature of the dry dock, is the transformation of the Crow’s Nest lounge to Explorations Central. Explorations Central, or EXC as Holland America calls its new destination immersion experience, combines a wide array of travel resources with enrichment opportunities for guests who want to make their travel experience more engaging. 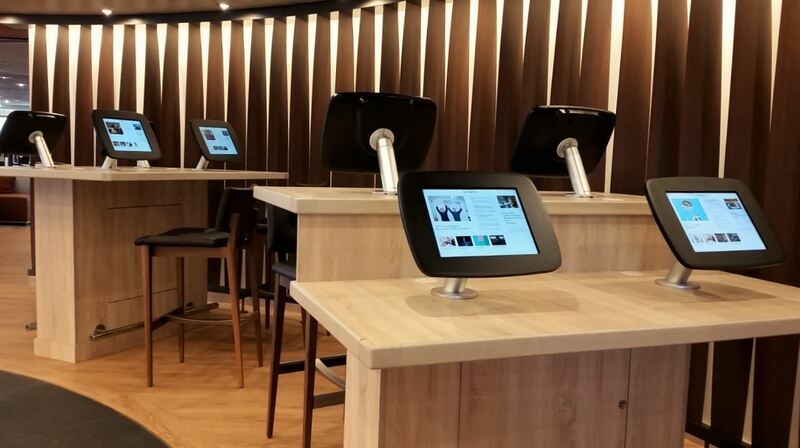 The starting point of EXC is The Hub where guests have interactive Discovery Tables, offering unique port information and interesting stories about all the ports Holland America visits, at their disposal. 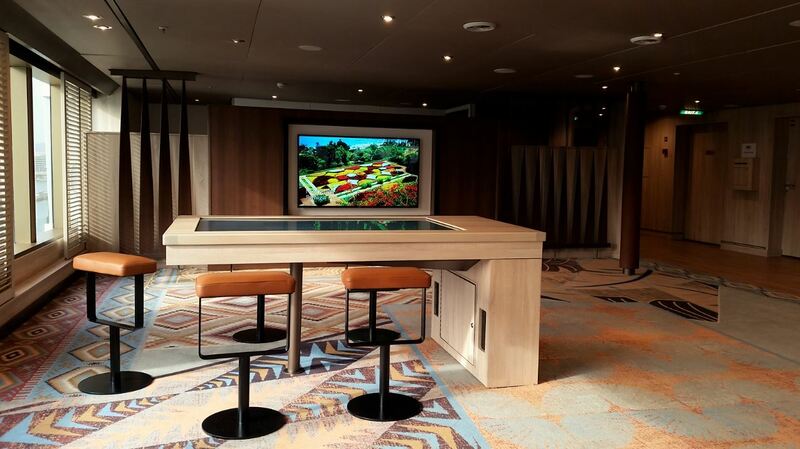 The Discovery Tables also serve as Future Cruise desk for guests wishing to start exploring their next cruise destination. Across from the Discovery Tables, at the EXC Experiences desk (the former shore excursions desk), EXC travel guides help guests create the perfect shore excursion with information about where to go or what to eat. Displays above the EXC Experiences desk provide general information about the current and next port of call, the weather forecast and even useful phrases in the local language. 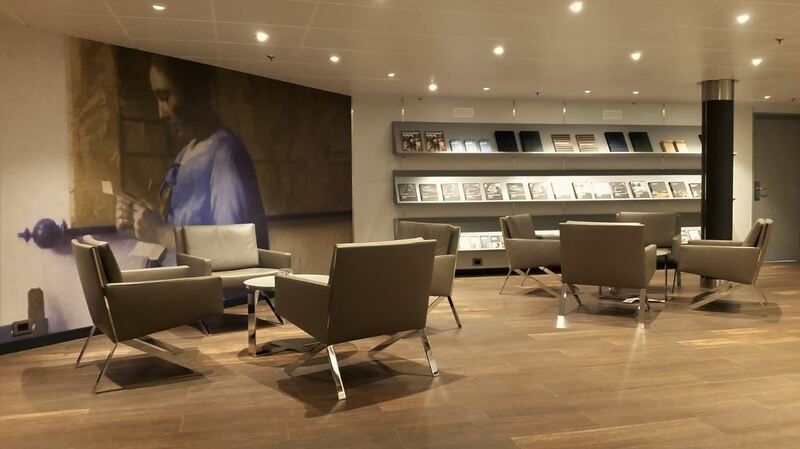 The EXC library provides information on the ship’s current and other Holland America ports of call, books exploring maritime history as well as the history of the Netherlands, the country where Holland America originated. 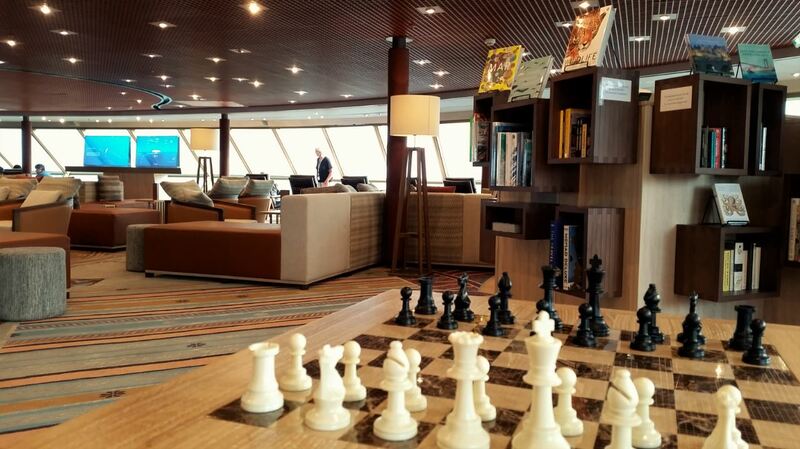 Next to the EXC Library and centrally located overlooking the ship’s bow is the Virtual Bridge. 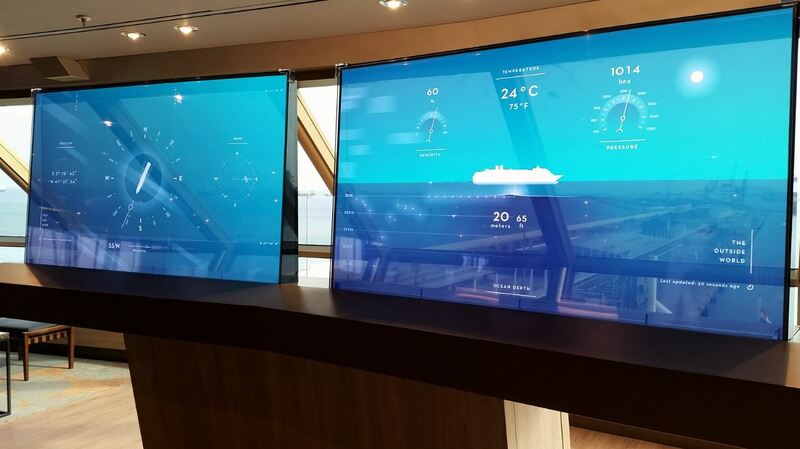 The two large see-through screens display offer some of the real-time information the Captain and his crew use to operate the ship including ship heading, coordinates, barometic pressure, humidity, ocean depth and speed. Towards the back of EXC the Destinations Display offers panoramic views of some of the most scenic ports on six large LED screens. Through interactive questions of the day, such as “Where have you had your best meal?” or “Where in the world would you like to go?”, the Destinations Display can be used to create more niche and exclusive experiences for future cruisers. During our visit (on debarkation day) the question of the day read “Where do you call home?” We answered by pressing the country of our choice on a touch screen and the Destination Display zoomed in on our country of residence followed by the most popular country. The Explorations Cafe serves coffee during the day and adult beverages at night. Here passengers can also find copies of the New York Times crossword puzzles, sudokus and a variety of New York Times content on iPads. Stateroom televisions also become a portal to the world through the EXC Channel offering films, documentaries and TV shows exploring the destinations on the ship’s itinerary. Finally for guests exploring the destinations on their own printed EXC Port Maps provide an overview of the best each port has to offer including tips from shipboard crew who have visited the port before. The second major innovation that is introduced onboard Westerdam is the result of Holland America Line’s sponsorship of Rijksmuseum. 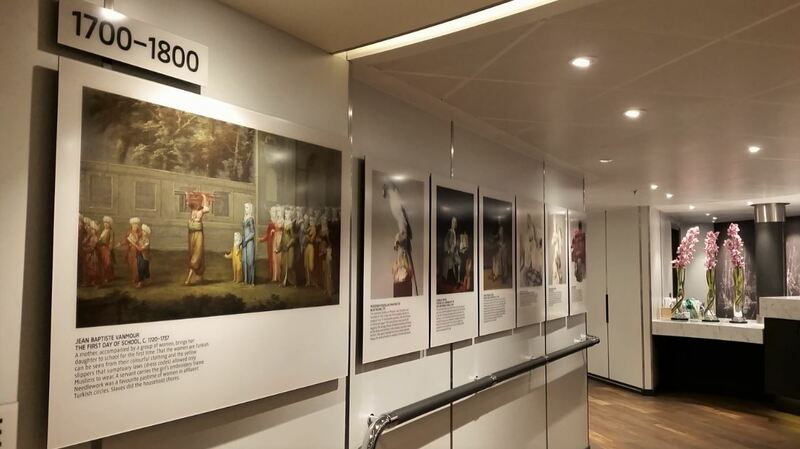 Through Rijksmuseum at Sea Holland America is able to bring reproductions of some of the museum’s most famous masterpieces onboard the ship giving guests the opportunity to learn more about Holland’s history through art. Located next to the Guest Relations desk on Deck One of the Atrium, Rijksmuseum at Sea aims to be more than just a floating art museum. Featuring a bright studio space with life-sized reproductions of artworks from the Rijksmuseum, it offers guests everything they need to create their own masterpieces through drawing, photography or just doodling. 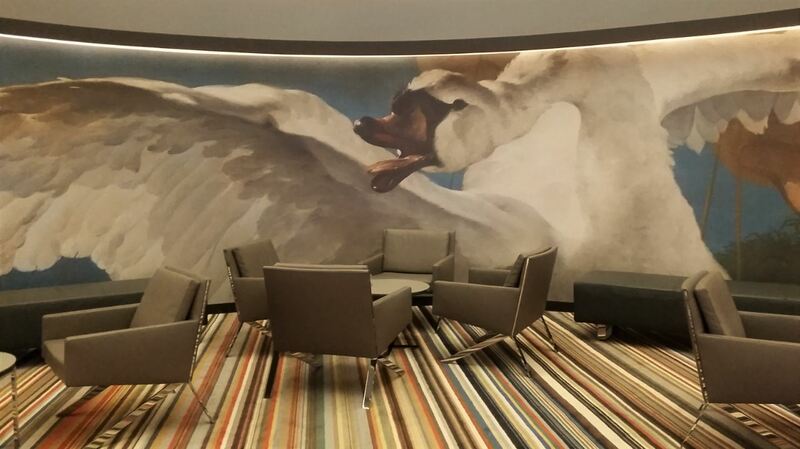 On one side the space is decorated with a huge reproduction of “The Treatened Swan” by Jan Asselijn. The work depicts a swan fiercely protecting its nest against a dog, the white swan was later thought to symbolize a Dutch statesman protecting the country from its enemies. 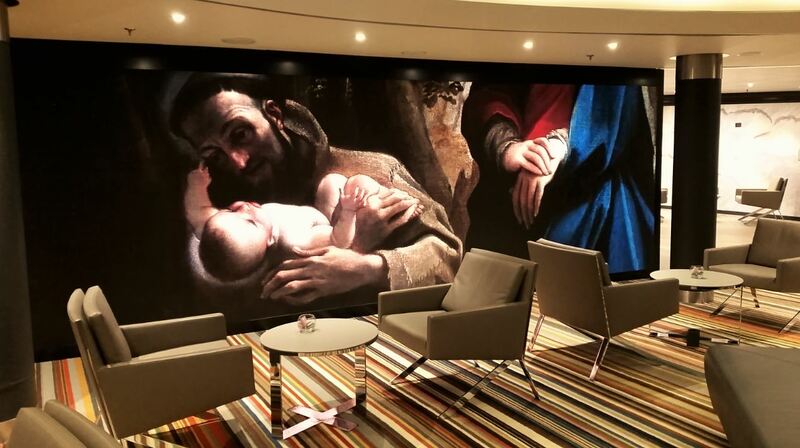 On the other side a giant LED wall showcases a collection of Dutch masterpieces. 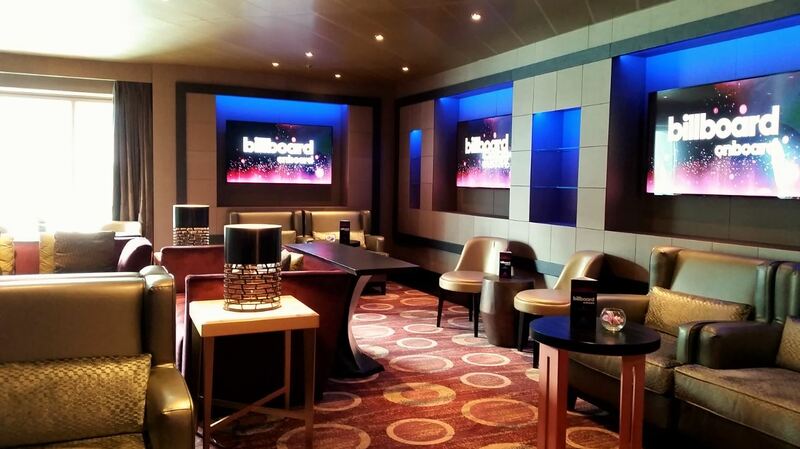 The ship’s $60 million refurbishment also included the addition of Billboard Onboard and Lincoln Center Stage, two popular entertainment venues which were first introduced on the line’s newest vessel Koningsdam. Both spaces host nightly musical performances and are part of the line’s new Music Walk and complement the already existing B.B. King’s Blues Club. The Northern Lights nightclub has been replaced with the intimate Gallery Bar. 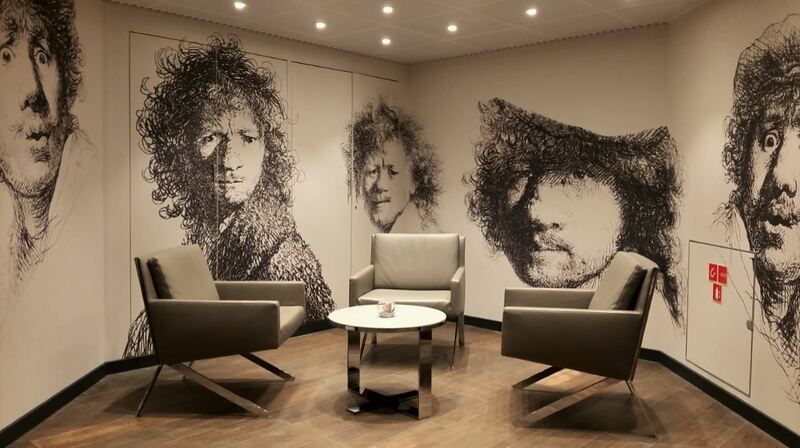 Decorated with a mix of artwork including portratis, landscapes, still lifes and abstract pieces, the new venue serves an exclusive cocktail menu created by celebrity mixologist Dale DeGroff. Westerdam’s refurbishment has also transformed the line’s signature steakhouse, Pinnacle Grill, which will on certain days be host to pop up versions of Sel de Mer and Taste of De Librije. 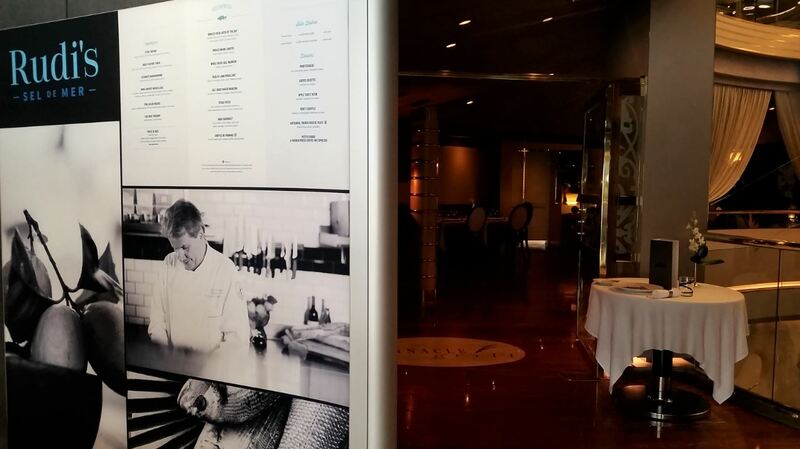 Introduced onboard Koningsdam, brasserie Sel de Mer serves classic French dishes with a cover charge of $49, while Michelin star chef and Culinary Council member Jonnie Boer’s Taste of De Librije pop up carries a $69 charge. Westerdam’s traditional buffet has been transformed into the Lido Market and features a more open layout and themed stations serving made-to-order or grab-and-go and items. Guests can now enjoy fresh-baked breads and pastries at Breadboard, classic comfort food at Homestead, dishes from around the world at Distand Land, freshly made personalised salads from Wild Harvest and sweet treats at Sweet Spot. 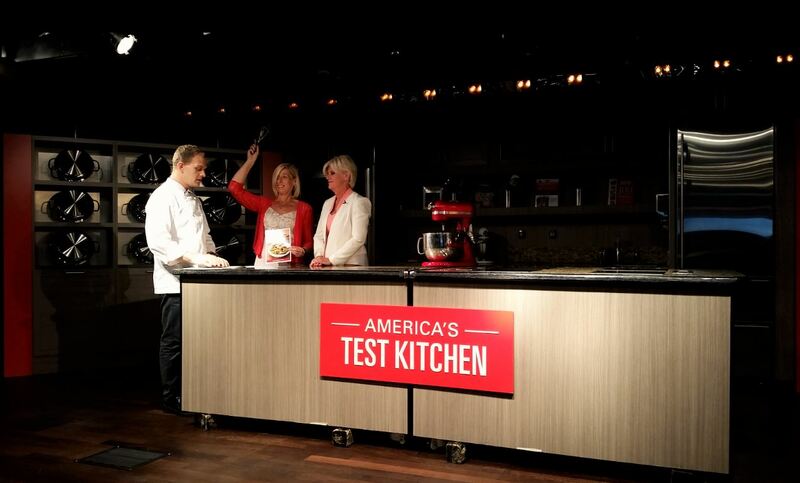 America’s Test Kitchen received a new colour palate and enhancements to the show kitchen with grey and red motifs as well as new tables and chairs for guests viewing the cooking demonstrations and hands-on workshops. 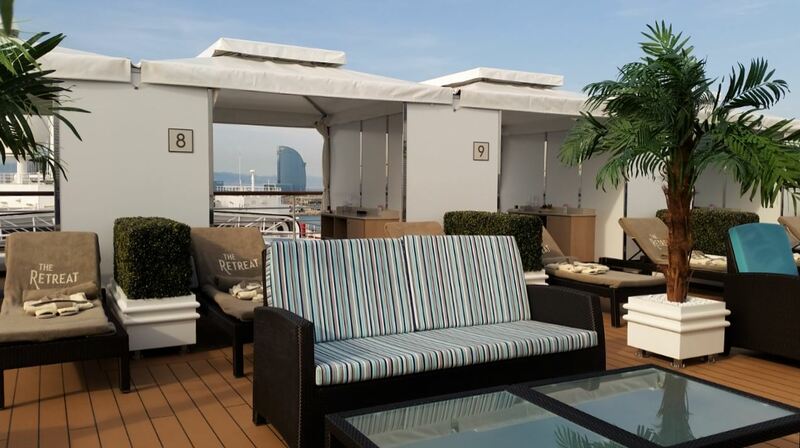 Previously located on Deck 10 the ships relaxing oasis at sea, The Retreat, offering a quiet lounge area and 15 private cabanas has been relocated to deck 11. To complete Westerdam’s transformation, 25 new staterooms were added on deck ten bringing the ship’s capacity to 1,964 guests. All staterooms now include new furniture, carpeting and wall coverings, designer glass tiles, new bathroom vanities, USB outlets on the headboard and bedside LED reading lights. The suites on board also received bathroom upgrades and new quartz-stone surfaces to the desk, nightstands and makeup vanity. 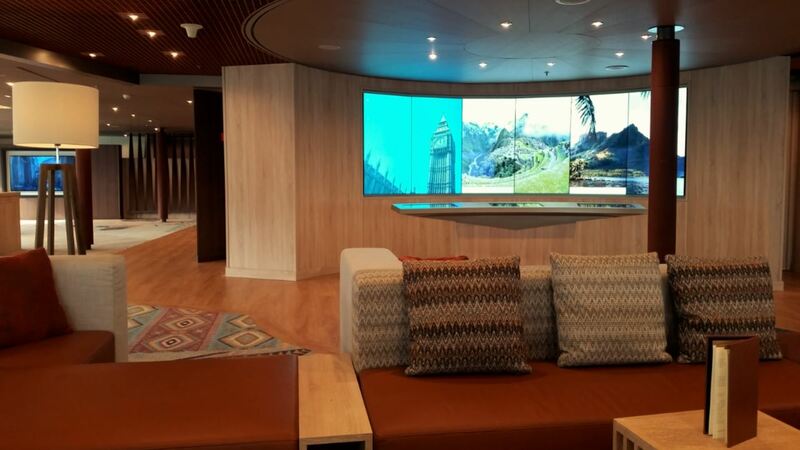 A new interactive television system, featuring large LED flat-screen TVs with complimentary movies and TV shows on demand as well as easy access to the daily program, shipboard information and guest billing, was also installed. Westerdam is currently offering Mediterranean cruises and will depart Venice, Italy on October 14, 2017 to Fort Lauderdale, Florida, USA. For more info and bookings visit www.hollandamerica.com.